This article explains the basic working principles of producing optical images with a single lens, as e.g. used in various types of cameras. Most of the aspects are essentially the same when using a multiple-lens system, for example a photographic objective or a microscope objective. The simplest possible method of optical imaging, which does not require any lens, but only a pinhole, has been realized with the camera obscura. This method has the severe disadvantage, however, that it involves a serious trade-off between resolution and light collection. One usually requires some method which can collect light from a larger area while maintaining high image resolution. The simplest approach with that combination of qualities is based on a single lens, as shown in Figure 1. Figure 1: Imaging of points from an object plane to an image plane. The light path is indicated with different colors for two different object points. Some of the light emitted from a particular point in the object plane (e.g. by scattering of illumination light on the object) gets to the imaging lens, which focuses it to a corresponding point on the image plane. Note that light from the object may be radiated in all kinds of other directions; Figure 1 shows only the light which hits the entrance aperture of the lens. The obtained image is inverted; for example, points at a lower position on the object are imaged to points at a higher position in the image. That image inversion does not matter for recording images with photographic film or an image sensor, but it can be a problem for direct viewing. Therefore, one may use additional optics, for example in an SLR photo camera a pentaprism for obtaining an upright image in the viewfinder. Similar techniques are used in some microscopes, particularly in manipulation microscopes. For a given size of an electronic image sensor, for example, the angular range over which object points can be imaged (the field of view) is approximately twice the arctan of half the sensor dimension divided by the focal length. For example, a 24 mm wide image sensor (DX format) combined with a 25-mm lens will result in a field of view of &approx;0.90 rad, which is approximately 51°. That value is similar to the viewing angle of the human eye, and therefore standard objectives work with such values. Using the same image sensor in combination with a tele lens, having a larger focal length, the field of view is correspondingly smaller, i.e., one can image more distant objects. Figure 2: For the same format of an image sensor, a lens with larger focal length leads to a smaller field of view. If one could increase the sensor size accordingly while maintaining its pixel spacing unchanged, one could image a wider range with the same resolution. Usually, however, a photo camera works with a fixed image sensor, and only the photographic objectives can be exchanged. Even if one could insert a larger image sensor, the objectives may not be designed for good compensation over its full range. Enter input values with units, where appropriate. After you have modified some inputs, click the "calc" button to recalculate the output. Figure 3: Illustration of the lens equation. where a is the distance from the object to the lens, b is the distance from the lens to the image plane, and f is the focal length of the lens. For imaging of very distant points, i.e., cases with a &Gt; f, the object is essentially “at infinity”; the lens equation then shows that the image plane should lie in the back focal plane of the lens (b = f). For objects at finite distances, however, the image plane needs to be placed in a somewhat larger distance (b > f). (One may consider that the divergence of the incoming light “consumes” some of the focusing power of the lens, so that less of it is left for focusing the beam again.) An imaging device such as a camera often contains some adjustment knob with which one can slightly move either the image sensor or the lens in order to fulfill the focusing condition for a particular object distance. This is essential for photo cameras, for example. If the focusing condition is not exactly fulfilled, the light received from a particular object point will be sent to a larger area on the image plane, called the circle of confusion (see Figure 4). This results in a reduction of image quality in terms of resolution. Figure 4: By using a smaller entrance aperture, one can reduce the size of the circle of confusion. This leads to an increased depth of field. If one uses an optical aperture just before or after the lens, this reduces the area to which light from one object point is sent, at least as long as diffraction effects are not substantial. For example, reducing the average diameter by a factor of two gives one twice the depth of field. However, that also implies a reduction of the light collection efficiency by a factor of 4, which may have to be compensated with an increased exposure time e.g. in case of a photo camera. The depth of field is approximately proportional to the square of the object distance, i.e., it becomes very large for large object distances. This is because the objects are then close to infinity, all requiring the image plane to be close to the back focal plane. However, the acceptable size of the circle of confusion may actually get smaller for distant objects, so that the dependence of the depth of field on the distance is actually weaker. Using a lens with smaller focal length can also increase the depth of field. For a fixed f number (focal length divided by aperture diameter), the depth of field is inversely proportional to the square of focal length, assuming that the allowed diameter of the circle of confusion stays constant (e.g. due to an unchanged pixel size of the image detector). When changing the f number such that the aperture size remains constant, the depth of field is only proportional to the inverse focal length (not its square). Note, however, that the modified focal length also affects the field of view (for a given sensor size) and the resolution of object details. For a constant object detail resolution and constant aperture diameter, the depth of field no longer depends on the focal length. The depth of field is increased when a larger circle of confusion is acceptable, e.g. when using an image sensor with lower resolution. Figure 5 shows how the diameter of the circle of confusion for an example case with focusing to three different distances. One can see that the distance range with good sharpness is much larger when focusing to a large distance. 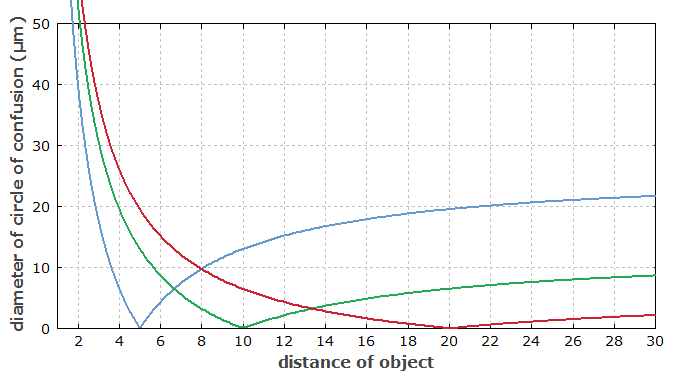 Figure 5: Diameter of the circle of confusion as a function of the object distance for a SLR camera with 38 mm focal length, f number 5.6, and focusing to three different distances. The hyperfocal distance is defined as the distance beyond which acceptable focusing is achieved for all objects without further focus adjustment. Objectives with small focal length exhibit a small hyperfocal distance. It then becomes easier e.g. to obtain a photograph with good sharpness for some foreground object as well as for a distant background. Indirectly, the format of the image sensor can influence the depth of field: the larger the sensor, the larger the required focal length for a certain angular viewing range, and that in turn reduces the depth of field. The depth of focus is the range in which the position of the image sensor can be varied without substantially losing focus. It determines how precisely that distance needs to be adjusted for a given object distance. In many practical cases, the depth of focus is far smaller than the depth of field. The depth of focus is also relevant for the question what amount of tilt of the image sensor is tolerable, because that effectively changes the distance of various image points to the plane of the lens. This shows that the magnification is not determined by the focal length f alone. In a photo camera, for example, it also depends on the distance to the object: the larger that distance, the smaller the magnification. Note that photographic objectives are optimized for operation beyond a certain minimum distance; when trying to focus on closer objects by increasing the lens–sensor spacing, various kinds of optical aberrations (see below) might no longer be well corrected. In photography, the magnification is usually well below unity, since one uses relatively small pieces of film or image sensors for taking images of large objects. Of course, one may later produce printed images with larger sizes, or display images on large computer screens or with image projectors. In that sense, the magnification is not relevant for the user. Of course, the imaging is never perfect, e.g. in the sense that light from one object point would be sent exactly to only one point (of infinitely small size) on the image plane. Therefore, there is a minimum distance between points in the object plane which can still be resolved in the image. An image sensor with higher resolution may not help, if the resolution is limited by diffraction or by the optical quality of the objective. A fundamental physical factors limiting the image resolution is diffraction at the aperture. As already mentioned above, operation with small aperture diameters can seriously limit the resolution, although at the same time it leads to a large depth of field. That effect cannot be altered with any optics design. Another possible resolution limit can be on the side of the detector. Photographic films – particularly those with high sensitivity – set such limits, and electronic image sensors as well through their finite pixel spacing. In addition, limitations of the optical performance of the objective can also limit the resolution. Which factor is the finally limiting one e.g. in photography often depends on the situation, e.g. the choice of objective, adjustment of a zoom objective, choice of f-number, etc. Due to chromatic dispersion, a lens will usually have a focal length which slightly depends on the optical wavelength. Obviously, that phenomenon can cause substantial degradations of image quality, called chromatic aberrations, since the visible wavelength range spans nearly one octave (roughly 400 nm to 700 nm). However, there are certain ways to obtain achromatic optics, essentially by properly combining different lenses made from different optical materials. Most optical lenses have spherical surfaces, because those are most easily fabricated. That surface shape, however, is not ideal for imaging; the outer part of the lens are then too strongly curved. This results in so-called spherical aberrations which can seriously degrade the image quality. Aspheric optics allow the realization of high-performance objectives with fewer components. This problem can be solved either by using aspheric lenses or by using a combination of lenses designed such that spherical aberrations are well compensated. The development of improved fabrication methods for aspheric optics has led to their increased use, allowing manufacturers to make high-performance objectives with fewer lenses – which can also result in improved light throughput. Comatic aberrations (coma) are aberrations related to off-axis incidence of light on a lens or lens system. It mainly affects image points in outer regions. Field curvature denotes the problem that the focal points of a lens as obtained with different incidence angles do not lie on a plane, but on a curved surface. There are also geometric image distortions, letting straight lines of an object appear as non-straight curves in an image. All such degradations of image quality can be minimized with certain design methods for objectives, and by operating objectives within reasonable parameter regions. If we assume for simplicity that the object uniformly sends light in all directions, the optical power received by the lens is proportional to the usable entrance area of the lens and inversely proportional to the square of the object distance. Obviously, a larger lens can collect more light and therefore produce a brighter image. In photography, for example, this means that pictures can be taken with a smaller exposure time, which may be advantageous e.g. to avoid any blurring of images related to movements of the object or the camera. A recent article in the Photonics Spotlight discusses the responsibilities of supervisors (professors and senior research assistance). Even if PhD students can carry out most of the work in a research project, vital inputs are needed from supervisors particularly in the planning phase and when a crisis occurs. A helpful supervisor does not only benefit the supported students, but contributes to the effectiveness of the whole research team. If serious engagement were the condition of authorship of supervisors, supervisors would be more likely to do their job. A substantial risk for science fraud arises only in a serious crisis – and is in that case strongly dependent on how the supervisor performs!